Looking good, Chet! With the big motor he will be really glad to have the coil-overs and brake upgrade if this is a cruising car, not a dragster. If he plans on driving the car hard, I would hope he has steel CC plates rather than billet. This is from hard gained experience by several friends of mine. I have to say though, I prefer the old wheels. To me the gold appearance clashes with the silver of everything else. Chet..I have a rear disc conversion Master Cylinder that is brand new. Brain can have it for free if he wants so he is that much closer to the rear disc swap. Just let me know. Actually I just checked I have two new MCs if you need one for one of your projects. They are basically a SVO MC or what they ran in the Lincolns back then--so not plastic ones. I had one in my 90 and I just sprayed it black. Last edited by only5.0s; 10-23-2013 at 09:37 AM. This car is coming out great! (it's my car) Chet really enjoys working on these cars, and does a great job! If anyone is interested in following this project or seeing what Chet is up to this winter at Tinys performance and customs come follow us on Facebook. 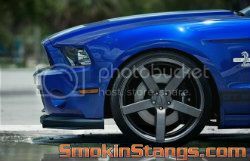 By Chet-b in forum Smokin Members "BUILDS & RIDES"...aka: Digital Storybooks!! Project Deztroyer - the ShopDezRacing.com 2012 Mustang GT project car!